While in Vegas, we ate at the Wolfgang Puck Bar & Grill… twice. Once for lunch on our arrival day (just the 3 of us) and once for dinner on the night before the wedding (all 18 of us). The restaurant is right in the middle of the casino at the MGM Grand, and therefore, subject to the ever-persistent aroma of heavy cigarette smoke that permeates the entire establishment and eveyone who enters it. 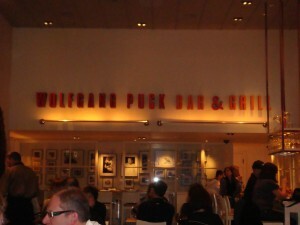 This is the case with many of the restaurants; however, Puck’s place is completely open and therefore, immersed directly into the haze. We started with the Truffled Potato Chips with Maytag Blue Cheese ($8). 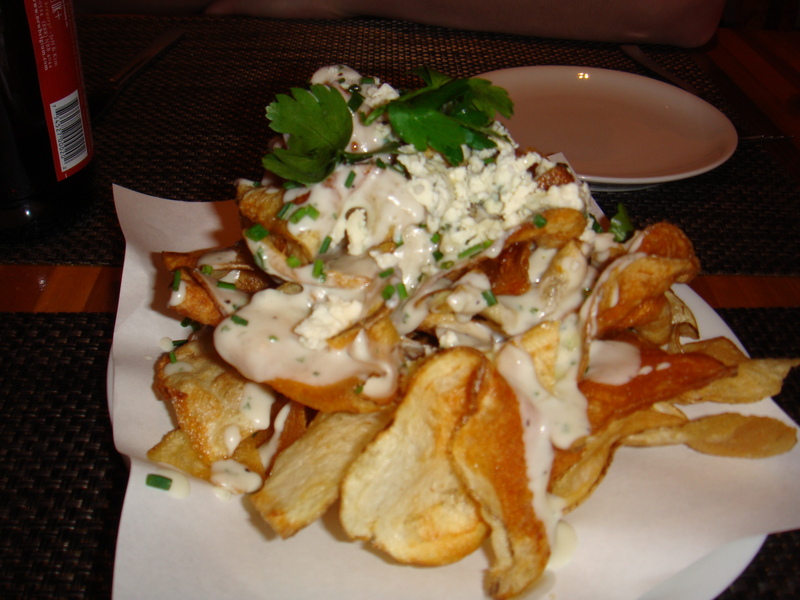 The chips and the truffle sauce tasted great together, but the blue cheese topping was way too overwhelming. I couldn’t eat them together. The earthiness of the truffle combined with the pungent cheese was just too much for me. 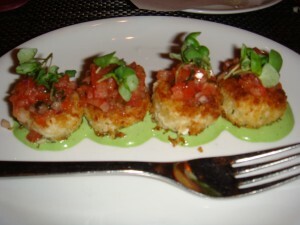 For lunch, I went with the Sauteed Maine Crab Cakes with Tomato Relish and Basil Aioli ($12). My first thought when these arrived was “holy crap… good thing I’m not starving!” You can see by the photo below, the crab cakes — compared to the the size of the fork — were really small. The crab cakes themselves were good, but not great. When eaten as intended… with the tomato relish and basil aioli… the overall flavor combination was very good. Not to say the ingredients were fresh… they were. It was just a bit over-priced for what it was… but even worse, a teeny, tiny, serving. The Husband got the Prime Burger with Vermont Cheddar and Smoked Onion Marmalade. He thought it was good… again, nothing spectacular. The 4-yo ordered off the kid’s menu (yes, they have one) and just got the personal Cheese Pizza. I had a bite and it was bordering on downright yucky. He ate it, but I was totally not impressed. Now the dinner we had there is a completely different story. We were in Vegas for a wedding and the night before we all went out to dinner together. The 4-yo fell asleep on my lap almost instantaneously, since we were still living on East Coast Time (making it 9pm to him)… so he didn’t eat, but our meals were incredible. I had the Grilled Salmon with Sunchoke Puree, Seasonal Vegetables and an Herb Sabayon. It was definitely my best meal of the new year so far. The salmon was cooked perfectly medium rare and the sunchoke puree and the herb sabayon were SO good. I literally left NOTHING on my plate. If the Husband’s parent’s hadn’t been there… I would licked the plate clean. I splurged and got dessert as well… the “Banoffee” (Banana & Toffee) Cream Pie Sugar Dough Shell, Banana Cream, Bruleed Bananas. TO DIE FOR. The Husband had the Roasted Baby Beet Salad with Citrus Vinaigrette and Humboldt Fog prior to dinner and re really enjoyed that. For his main course he had the Veal Ravioli with Mushrooms, Brown Butter and Crisp Sage . Obviously I didn’t try that one, but he seemed to enjoy it. So overall, we had a very good experience at dinner and only a so-so experience at lunch. The service was even worse at lunch and the hostess was bordering on quite rude. Dinner was another story. As with most Vegas restaurants (I’m assuming, since this was my first visit), these are very expensive and touristy… and I just can’t deal with the smoke. I think if we go back, we’ll choose to dine in restaurants that aren’t in the heart of the casino (which we did a few nights later). It makes the experience much nicer and a bit more relaxing.